In today’s post I am going to review a product that I really love (<3) and has changed the look of my nails! For many years I have been searching for a top coat that actually dries quickly and now I have found it!What is this miravle top coat? 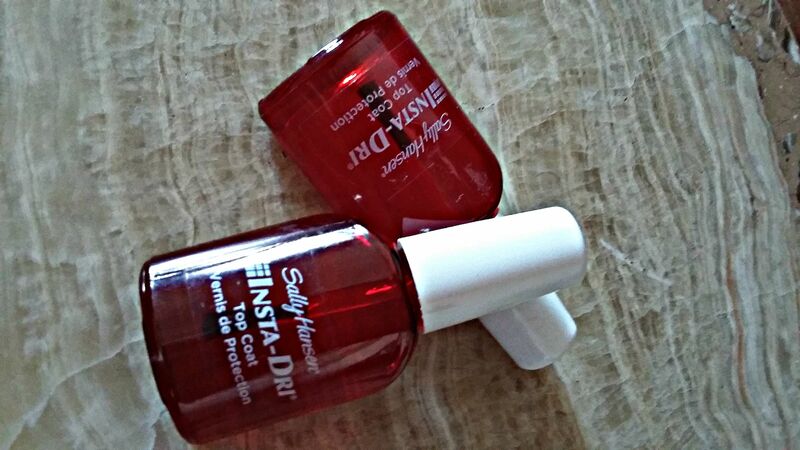 The Sally Hansen Insta Dri Top Coat. a nail varnish that can be applied on any nail varnish and dries in a few seconds.It also has a UV filter which protects the nail polish colour. Why is top coat so important for you? I wear compressive (orthopedic stockings) which means that when I paint my nails I need something that dries quickly otherwise when I have to move my compressive stockings slightly, the nail varnish gets messed up. I have had my nails done professionally and have tried all different types of quick drying nail varnishes, but I haven’t been happy until now! Seriously I can’t stress how happy I am with this top coat! This is heavy-duty top coat!! So, how fast does this dry? Very quickly. I wouldn’t say a few seconds, but definitely after 5-7 minutes you can do anything!! I have been saved. No matter what nail varnish I use underneath when I use the Insta dri top coat, it dries. Yes, but not shine in your face. Just a bit. After two days of mild water usage, yes it chips. I reapply though and all is good. Does it wreck my main nail varnish when I apply it? Nope. It actually makes my colour nail polishes look more smooth. Does it protect my nails? It makes your nails stronger,yes, but that may also be because you have already applied base coat, nail varnish and top coat. Definitely yes. I have already stocked up. Everywhere. I got one from Boots and a second one in TK Maxx (UK). I know there are Sally Hansen products in Sephora as well (at least in Greece). *You can also buy it on Amazon by pressing here. Amazon sells it for $5.27 (at the moment of this post). I am a teacher, not a beautician or nail artist. I am talking to you about this product like I would talk to my friends. I am only reviewing products I have used, tried and loved. Feel free to leave a comment in the comments section below. *This is an affiliate link. The opinion is my own. I have not been sponsored or received any money for this review. I purchased the product myself. If you choose to buy this product from amazon, I will receive a little bit of money. If you do not, that is fine. I highly do recommend the product. Thanks for reading my review. I usually don’t use top coat exactly because it takes ages to dry. And I don’t have the patience! May have to give this one a test if it means I can wear the polish a little longer. The fact that I wear the ortho. stockings makes nail polish ‘wearing’ so hard for me. I really, really recommend this product!! I use any type of nail polish underneath. I have used Dior, Barry M. even Estee (which I am not happy with btw) and it works. You wear orthopedic stockings so you understand what a pain it is when you have to adjust your stockings. Mine always wrecks, but now, tis has saved me. Yes, you wait a bit, but when it dries, it dries!!! Oh I am a BIG fan of Sally Hansen top coat! It really keeps those nails strong.